The Ask: Moses Used a Specific List. Shouldn’t You? Do you feel awkward when you write an ask? Sometimes, I do. It helps me to look at The Ask from the giver’s point of view. For instance, when I’m invited to a wedding, I appreciate a bridal registry list. It shows me what the couple needs for their new home (such as two sets of towels or a toaster). And the more specific, the better – navy blue towels, for instance, rather than sea foam green. Likewise, I appreciate a list of options in a solicitation. The information shows me what can be accomplished with the investment (example: $27 provides clean drinking water for a child; $108 provides clean drinking water for a family of four). A list of giving options guides the giver. And it allows different people with different giving capacities to participate at their own levels to combine forces and meet the need. When God called Moses to take an offering from the people of Israel to build a tabernacle in the desert, He was specific about the needs. He provided a list! 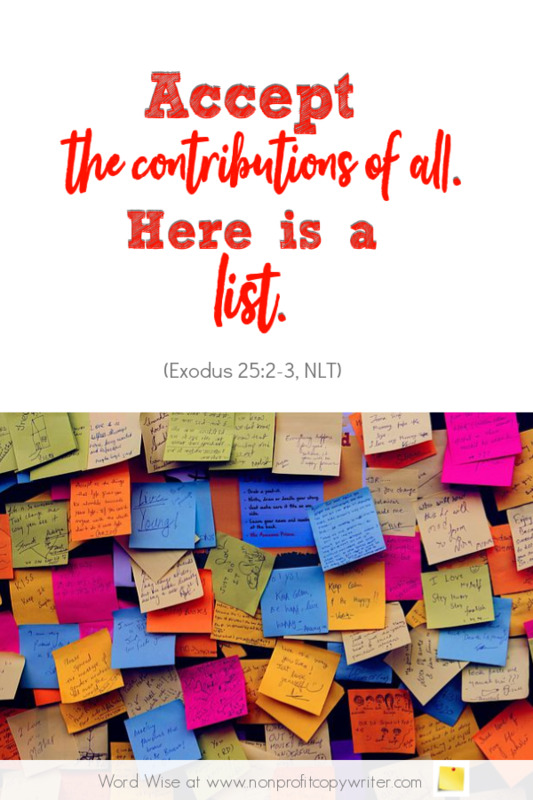 The list allowed the Hebrew people to contribute to the tabernacle with whatever they had and at their own level, knowing it would be combined with gifts from others and used to meet a particular need. Don’t you love the fact that we are to be specific as we write about a need? Moses was. On direction from God. Be specific when you write an ask. You are a God of details. Let me model my writing after Your ways. Show me specific details as I present a need and let me make The Ask accordingly. The Appeal: Why Offer Readers Different Ways to Respond?